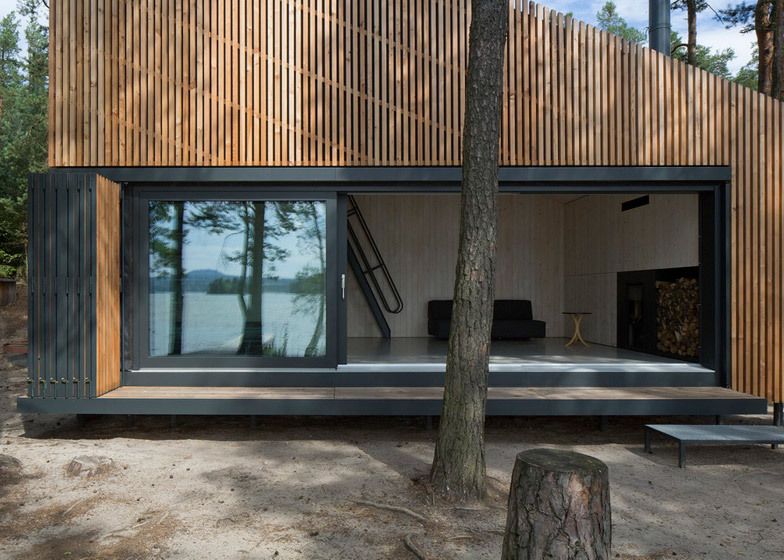 This wedge-shaped cabin in the Czech Republic, by Prague studio FAM Architekti, has a folding screen set into one of its slatted timber facades to open the interior out to a nearby lake (+ slideshow). 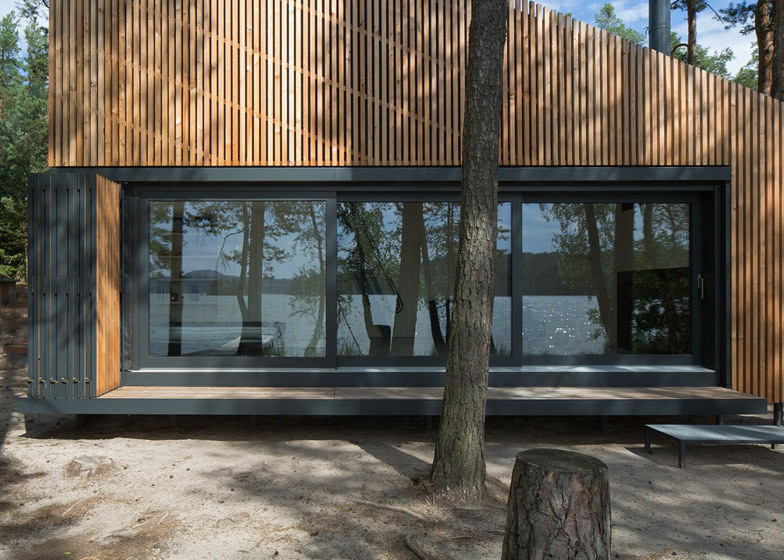 The building replaces an old cabin on a site beside Lake Mácha in North Bohemia and was designed by FAM Architekti – the Prague office of British firm Feilden+Mawson – as a year-round retreat for a client with a keen passion for yachting. 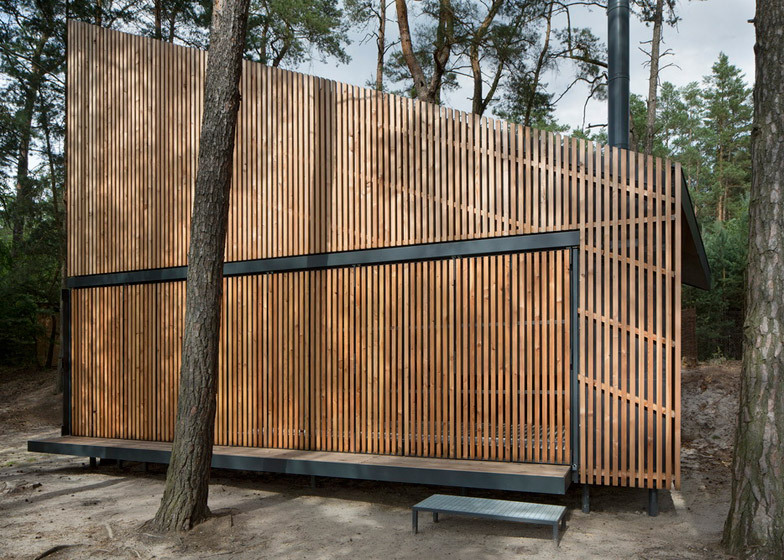 Erected within the same boundaries as the former 1970s cabin, which was lacking suitable insulation and infrastructure, the simple wooden structure offers an improved connection with the forested site. 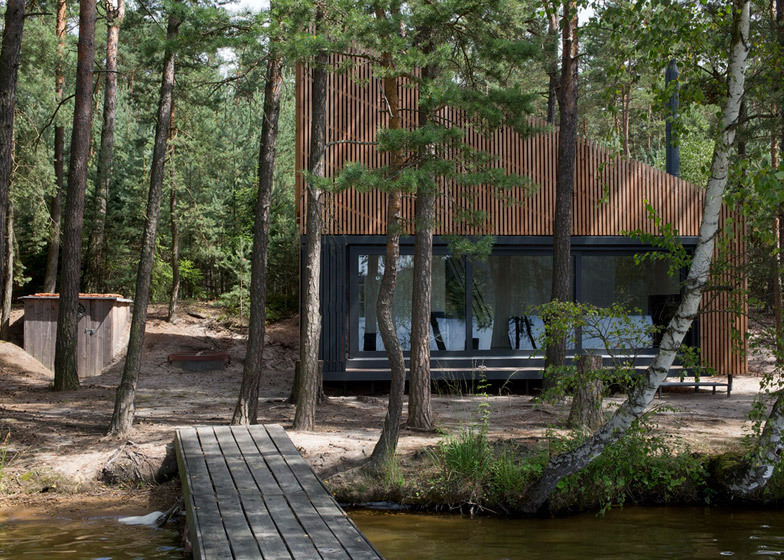 "The main aim was to create a relaxing retreat that would visually connect to the lake and the dense woodland around the building – a structure that responds to its natural context," architect Pavel Nasadil told Dezeen. 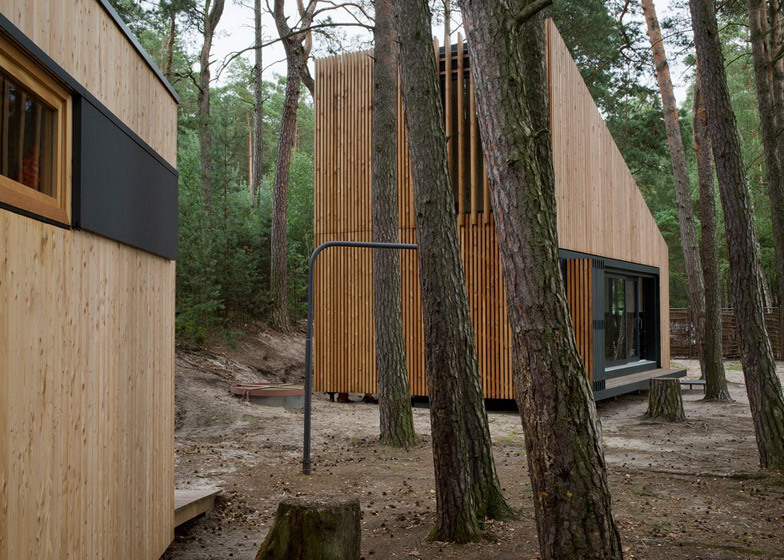 Wood was chosen as the most suitable building material because of the cabin's environs and because the construction methods caused minimal disruption to the site. 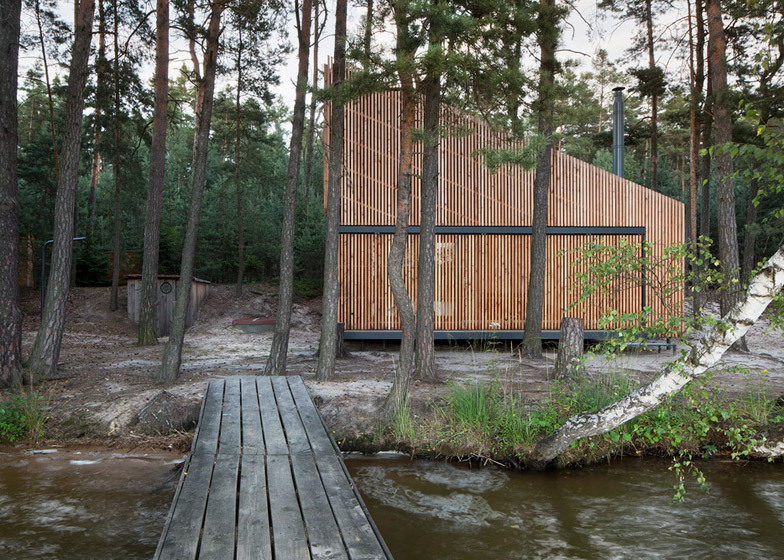 "The lake is a holiday destination with timber construction already present in cottages and cabins," explained Nasadil. 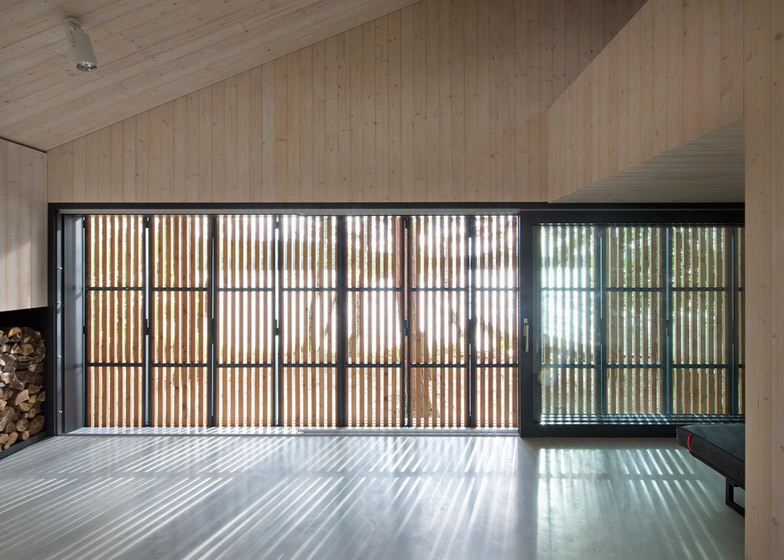 "We aimed at a lightweight building which would not embed itself in nature with concrete foundations, but was more sensitive." 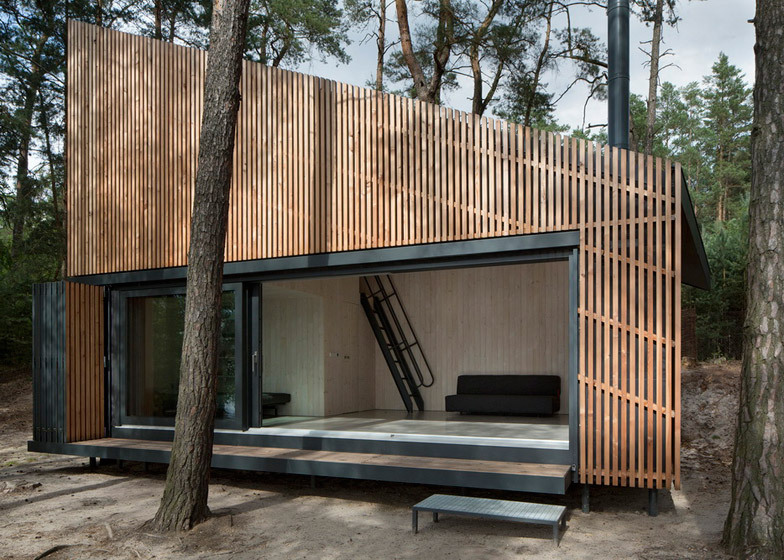 The cabin is raised above the forest floor on steel screws that allow the sandy terrain to continue underneath. The use of prefabricated construction techniques also helped to reduce the build time for the project, which was limited by the harsh winter weather. 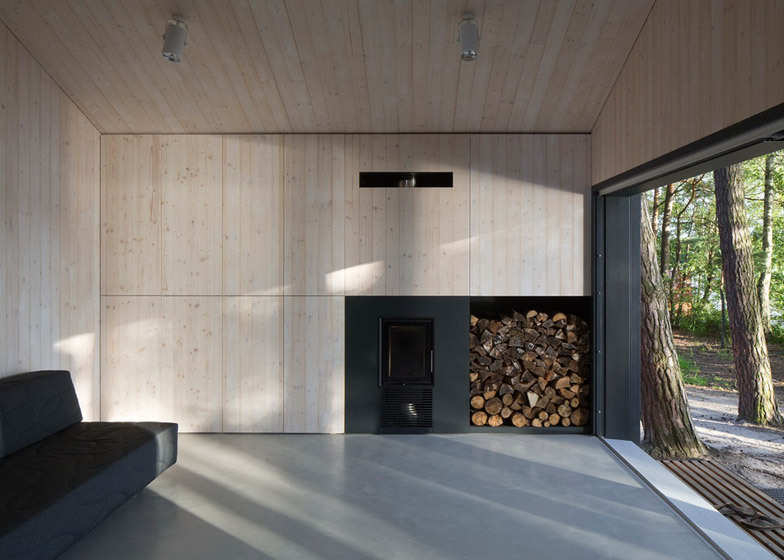 Components for the timber framework were laser cut and transported to the site, where they were assembled in just one and a half weeks. The client oversaw the rest of the building process over a period of ten months. 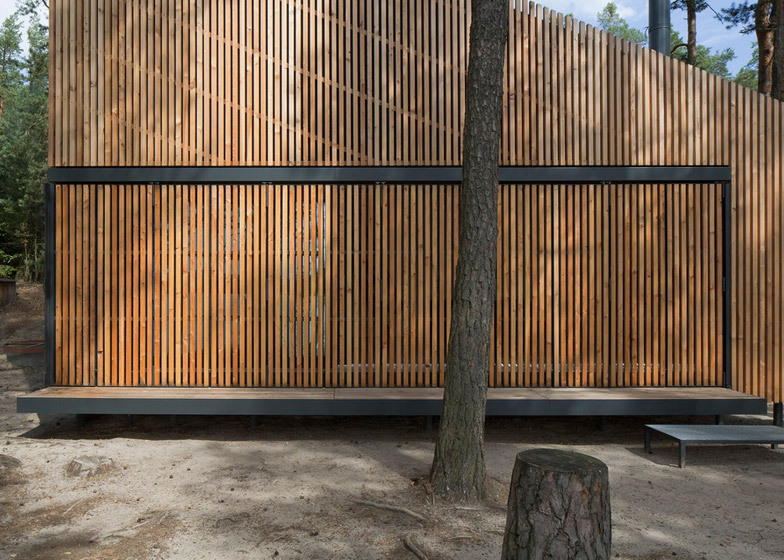 Vertical larch battens cladding the cabin's exterior reference the trunks of the surrounding pine trees and continue across the folding shutters, creating a sealed facade that protects the cabin when closed. 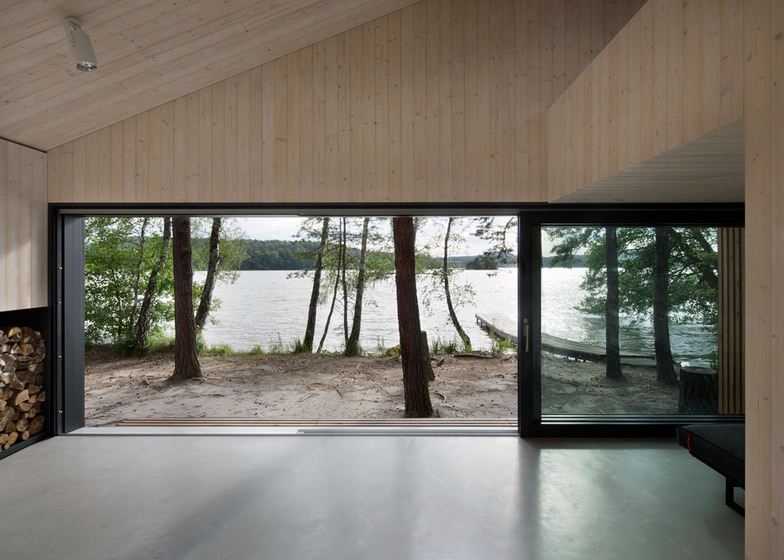 When fully opened, the shutters reveal a glazed wall that provides an expansive view of the lake. 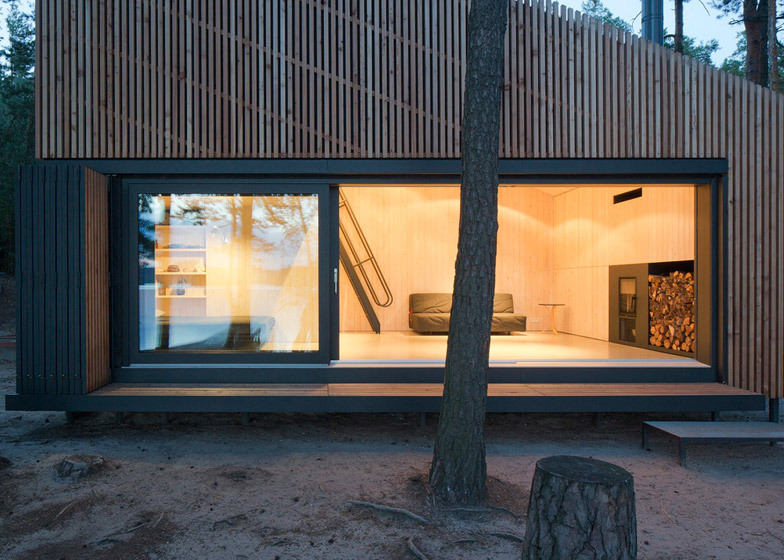 The glass surface is split into sections that slide open to connect the interior with a small decked space outside. 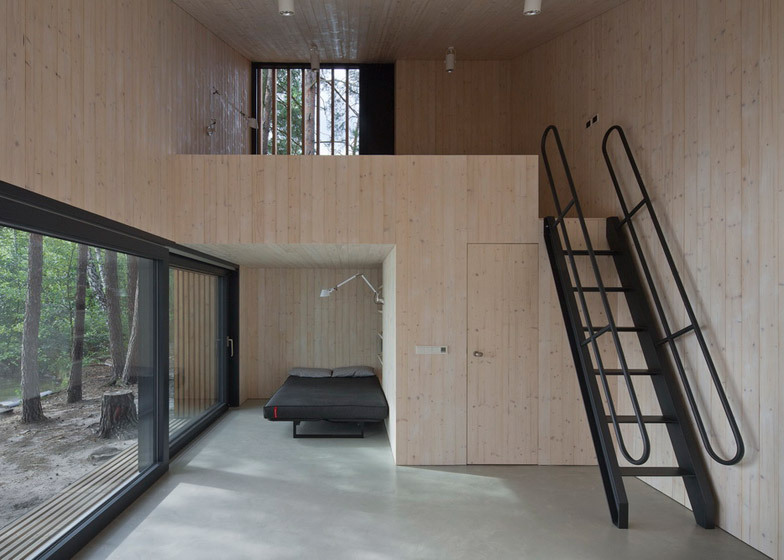 The building's steeply pitched shape is determined by the internal spatial arrangement, with the taller end accommodating a sleeping platform, above a basic kitchen, toilet and shower. 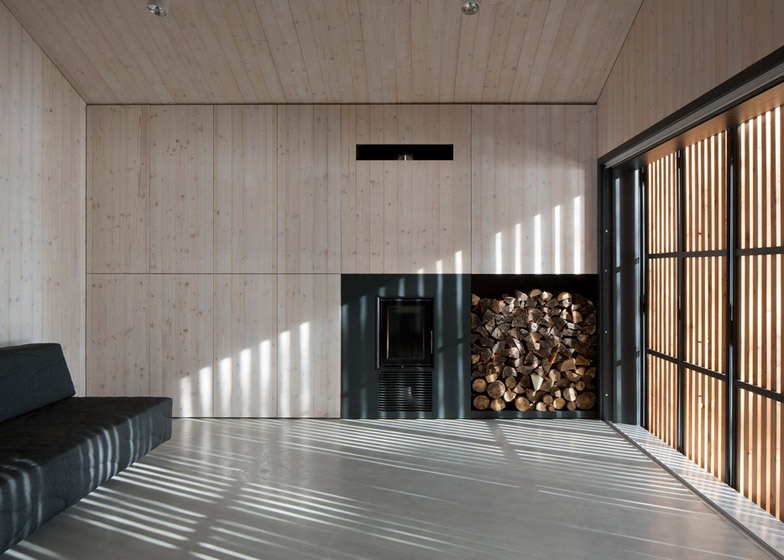 Timber cladding treated with a white oiled finish is applied to the walls and sloping ceiling of the main space to give it a unified "cave-like" appearance. 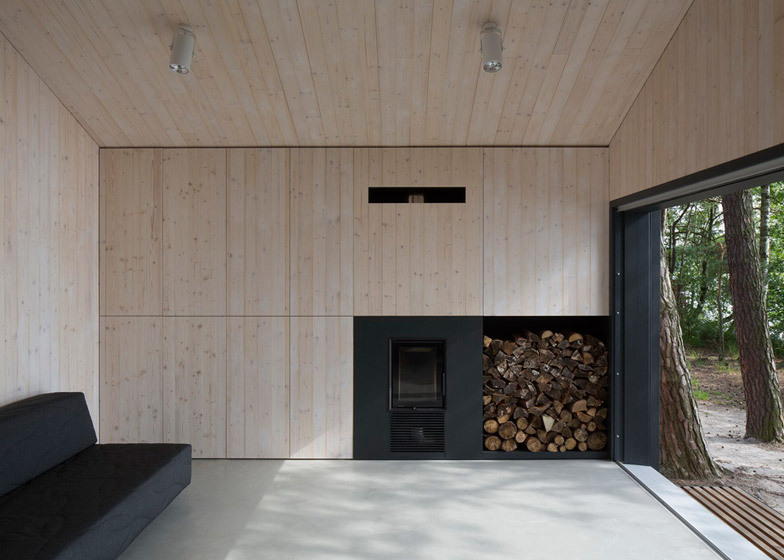 A fireplace and log store are built into the end wall, which also contains hidden storage. Cement screed flooring with a sandy tone was added to create a visual link with the ground outside. 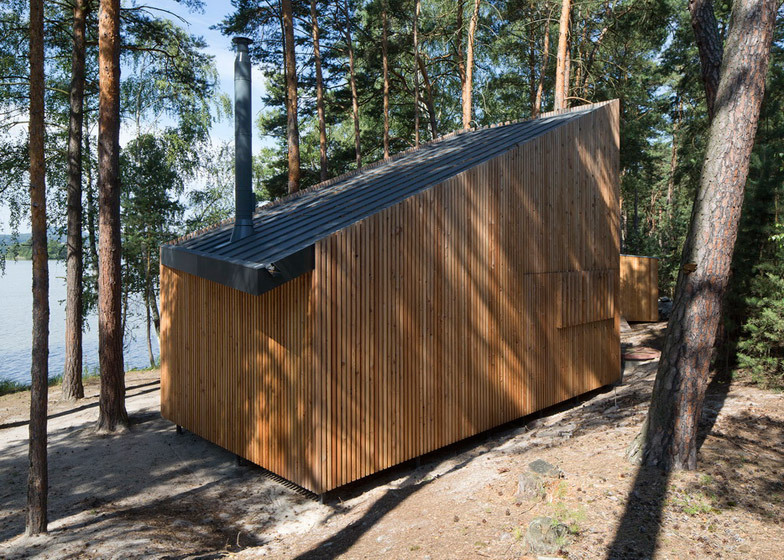 The architects also designed a small shed next to the cabin for storing surfboards, barbecues and other equipment for outdoor activities. 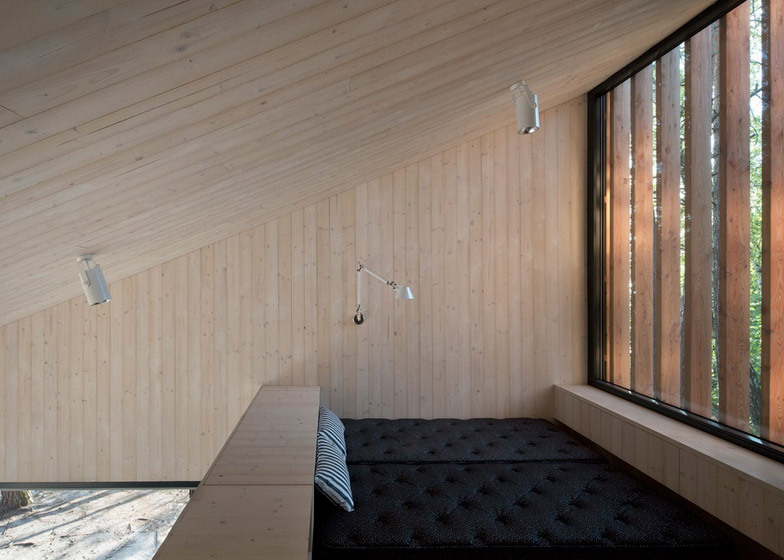 Other projects by FAM Architekti include a family retreat in the mountain village of Pernink with windows scattered across three sides of a simple white box. Photography is by Tomas Balej.